The question, “What was the first Orthodox parish in America?” is surprisingly difficult to answer. A big part of the problem comes from that word, “parish.” What is a parish? When does a collection of Orthodox people become a “parish”? It’s a matter of interpretation, and particularly in the early years of Orthodoxy in America, the lines are quite fuzzy. In 1860, Mr. Nicholas Benachi, a businessman and Consul of the Royal Government of Greece, spearheaded an effort to secure a site for the construction of the Church, which was also unsuccessful. Finally, in 1864, Mr. Benachi offered his personal property for a temporary location for worship, at which time he and a few cotton merchants the Church. Until 1866, services where held there as well as other locations, with the Very Reverend Agapios Honcharenko serving as the first priest of the Community. During that year, Mr. Benachi sold a parcel of property to the Community (for $1,200) on 1222 North Dorgenois Street and, with the assistance of generous donations by Mr. Benachi, Mr. Demetrios Botassis and Mr. John Botassis, Holy Trinity Church was erected. There are some issues with that account — most especially the reference to the supposed “first priest” of New Orleans. This man, Agapius Honcharenko, was a rogue Ukrainian deacon who seems to have been ordained a priest in Greece (under unclear circumstances) and showed up in New York City in early 1865. He got word of an Orthodox community in New Orleans and went down for a visit, but based on his public statements in the New Orleans newspapers at the time, he only intended to visit for a couple weeks — he never planned to stay as the resident priest of the parish. After his visit, he returned to New York, but once news spread of his sketchy past, he left the city and ultimately settled in the San Francisco area and lived the rest of his life as a kind of oddball farmer, outside of Orthodoxy. The actual first priest of the Holy Trinity community in New Orleans was Fr. Stephen Andreades, who arrived in 1867 from the Church of Greece. So when did the New Orleans parish begin? 1864, when lay services were held on the Benachi property? 1865, when Honcharenko visited and served the first Divine Liturgy? 1866, when a parish building was constructed? Or 1867, when the first parish priest arrived? And then there’s the other contender for the title “First Orthodox Parish in America” — Holy Trinity, the OCA cathedral in San Francisco. It’s gone through many name changes over the years, but this San Francisco parish was established right around the same time that the New Orleans community was organizing itself. 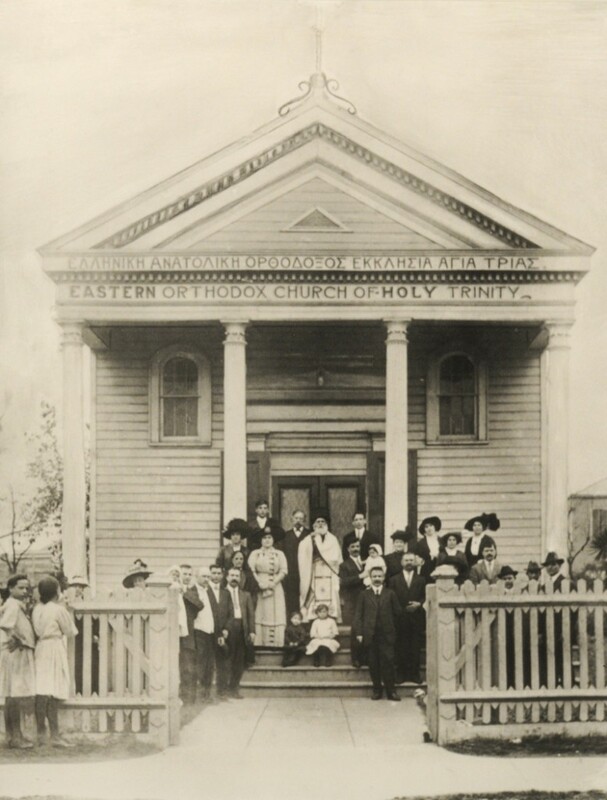 Holy Trinity Cathedral Parish traces its history to December 2, 1857, when the first Orthodox Society was founded in San Francisco. Ten years latter, on September 2, 1867, it was incorporated as the Greek Russian Slavonian Orthodox Eastern Church and Benevolent Society. During these years, the Orthodox population of the Bay Area was spiritually and sacramentally served by chaplains from Russian Navy ships that frequented San Francisco Bay. During the Holy Week of 1868, an Orthodox Priest was sent to the City from Alaska to conduct the Paschal services here. So, again, there’s the question, when did this parish begin? 1857, when the first Orthodox benevolent society was founded? 1867, when the society was incorporated (and, late in the year, requested a priest and a church building)? Or 1868, when the first parish priest arrived? It all depends on your premises — on how you define “parish.” And it might depend on specific facts that we don’t necessarily have, such as what exactly that Orthodox Society in San Francisco was doing, as a practical matter, in the years 1857 to 1867. Were they holding regular services? Or was this more of a typical “benevolent society,” where individuals with a common background (say, being Orthodox) would contribute to the organization, which would then give aid to members in need? One small bit of evidence to consider, in this case: at the General Convention of the Episcopal Church in 1862, an Episcopalian priest from San Francisco reported that “some” of the 300-400 Orthodox people in San Francisco were “under his charge” (although not receiving communion) and “were about to build a church of their own and become organized into a parish.” (From the San Francisco Daily Evening Bulletin, 12/6/1862.) It’s just one source, but this suggests that, at least in 1862, the Orthodox in San Francisco weren’t yet a parish, although they were definitely moving in that direction. Of course, which was the first parish doesn’t really matter, does it? Both of these parishes began as informal or semi-formal groups of Orthodox laypeople and evolved to the point that they were able to have a church building and obtain a parish priest. They did these things at pretty much the same time, getting their first priest within months of each other. I’m fairly comfortable calling this a tie — the two Holy Trinity Cathedrals are the first Orthodox parishes in the contiguous United States.